So here’s a very quick way of how it was made! 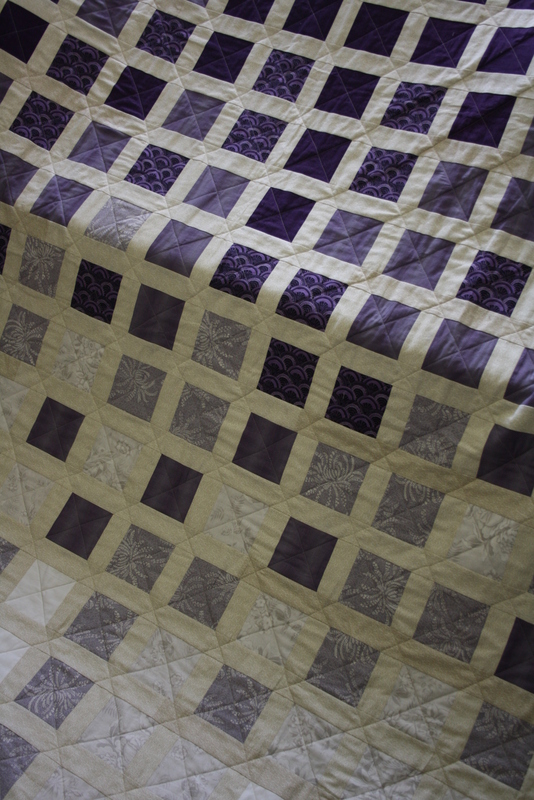 Sally (my cousin) wanted purples and lilacs in her quilt, so I set off first finding the best block/quilt design that jumped out at me and gave me an insight of how to work and manipulate her colour choice. I found a great picture in google images of this quilt using shades of green blending in to neutral and white toned fabric. It was titled ‘Jungle Rain’ and it was exactly what I was looking for! 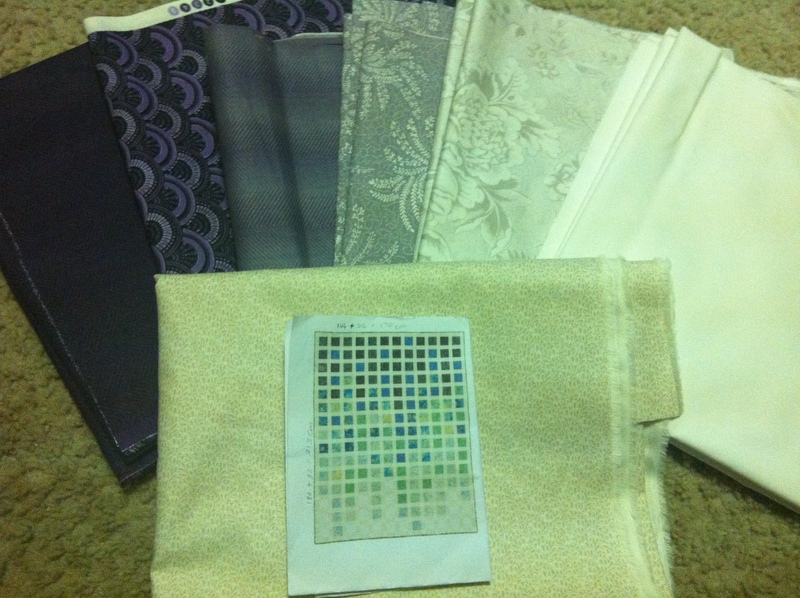 These are the fabrics I chose that I thought best suited and that Sally would like as well as the original picture of the ‘Jungle Rain’ quilt I followed from. 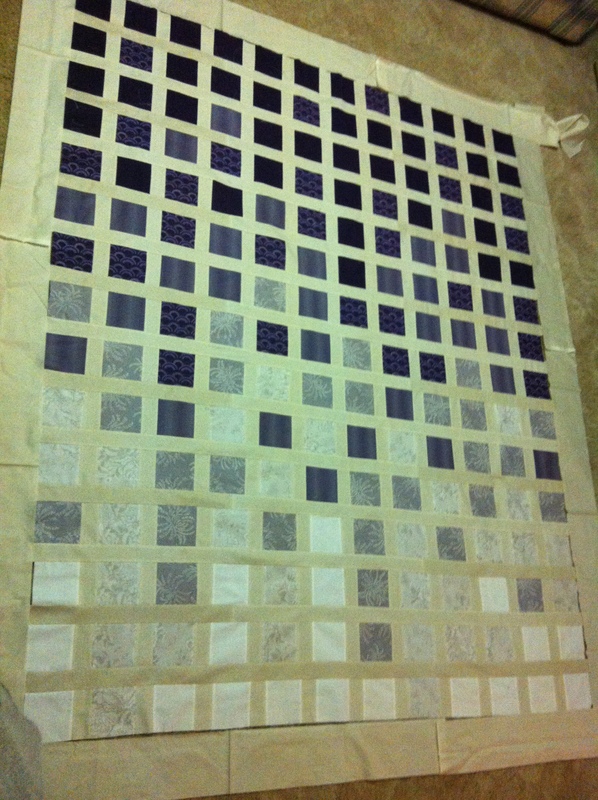 After sewing all the sashings on and sewing the strips together, I began to add the border to finish off the quilt top. Only now I could really start appreciating the graduation of colour and tone between the purples, lilacs, neutrals and whites. It’s easy to say that I was mega pleased with how it was coming on and just how awesome it was looking! 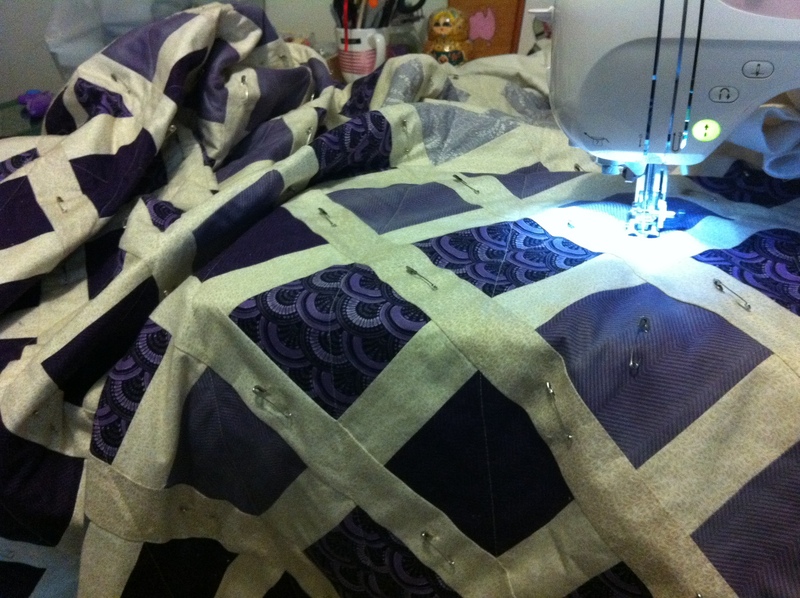 So now it came to the step of quilting I hate with a passion: basting! This quilt is close to queen size and it took all of my safety pins plus extras that had to be bought to baste this baby up! 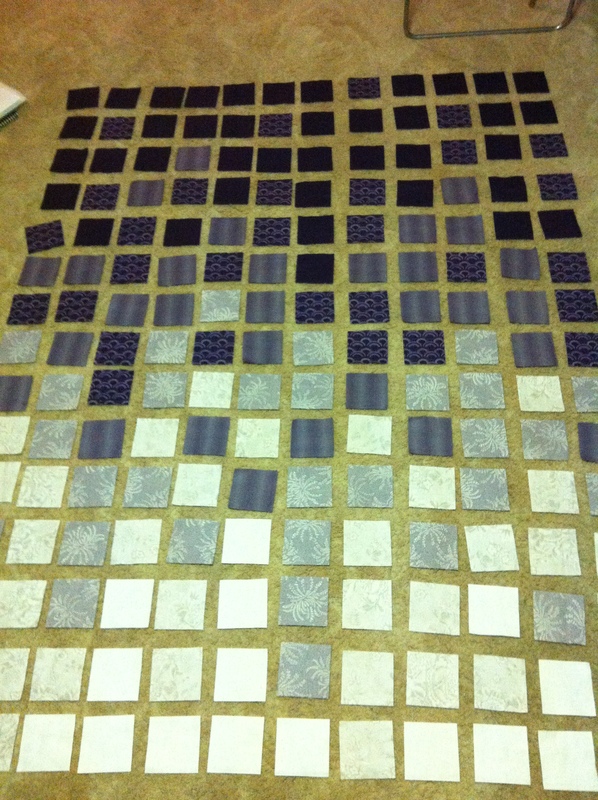 But with alot of persistance, patience and alot of cursing, I did it and started the mammoth task of quilting it. 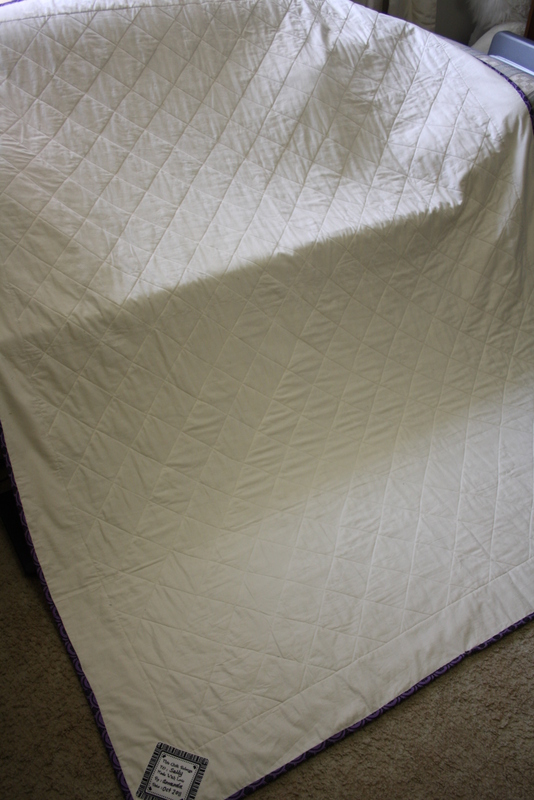 I chose a really simple but effective straight-cross quilting that gave a tradtional and elegant feel to the quilt. And added great texture to the front and back! 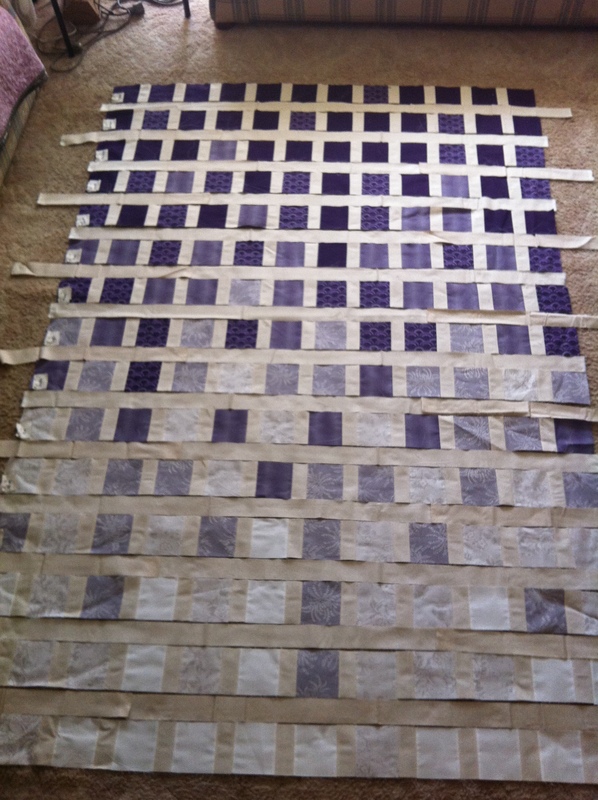 Finally onto the finishing touches, binding, in which I chose to use one of the deeper purples to bring all the colours together and tie it all up and……ta-dah!! The finished result! And the back…..which I think is as awesome as the front! And that’s it! Now it’s ready to be sent over just before the cold winter months come along in the U.K…. Previous PostHello world! Next PostCheers, to a Creative New Year! thanks for the approximations about the blocks. Now, how wide were the sashing strips? 1/2 the width of the blocks perhaps? 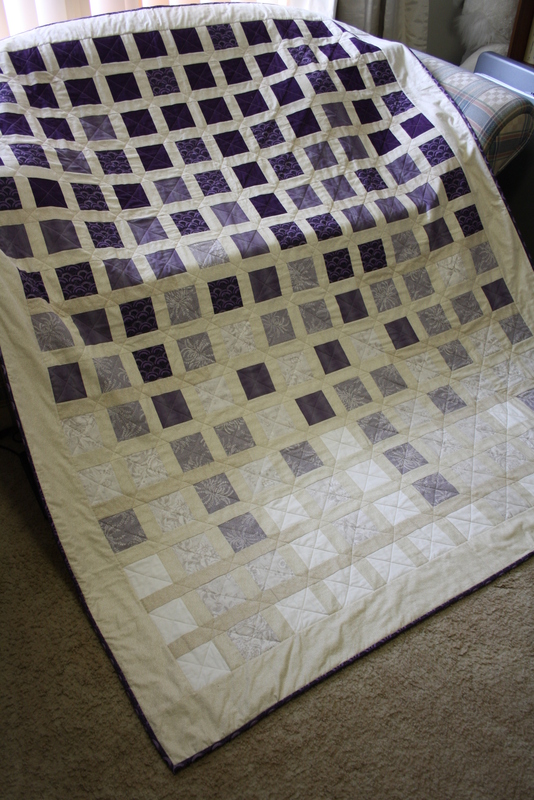 It’s been a while since I made this quilt, so I can’t quite remember what size I cut them at. 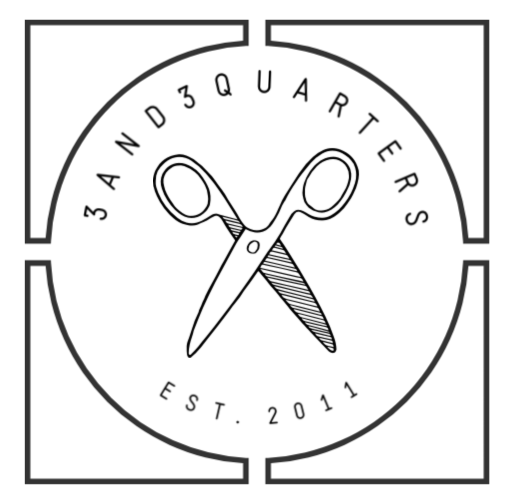 But looking at the quilt, I think they could be either 4″ or 4.5″.